Held at newly renovated Ben Ean, Lindeman's Estate, the evening paid homage to those who have contributed significantly to the Hunter Valley Wine & Tourism Industries. This year's highest honour was presented to a wine luminary who has reached 'Living Legend' status through more than 30 years' continuous involvement and two hospitality greats that have made a significant contribution to wine and tourism in our region. Greg, Robert & Sally's new status as Living Legends puts them in the company of well-known names such as Jay Tulloch, Brian McGuigan, Ian Scarborough, Fay McGuigan, Max Drayton and last year's winner, Ian Tinkler. Hosted by Sally Evans, the daughter of the late Len Evans, the night was once again a whirl of delicious cuisine, fine wine and bubbling personalities as the industry honoured the passionate contributors who make Australia's oldest wine region the very special place it is today. 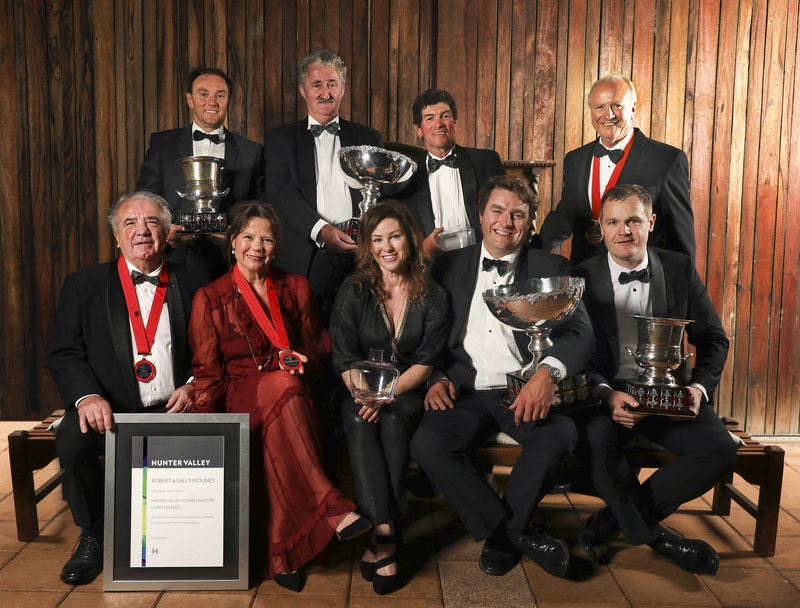 'The Hunter Valley is the oldest and most visited wine region in Australia by overseas tourists and its incredible wines have found their way into the homes of many others, thanks to the hard work and vision of all our winners,' Mr McGuigan said. Winners pictured above front row left to right: Robert & Sally Molines, Lisa Margan, Stuart Hordern, Aaron Mercer. Back row left to right: Andrew Margan, John Drayton, Neil Stevens, Greg Walls.